A statement released by the Santa Clara Valley Water District today put a happy spin on CEO Beau Goldie “retiring/resigning,” but let’s cut to the chase: He got canned. The 31-year district employee, the last seven of which had him at the helm of the nearly $400 million public agency in charge of water for 1.9 million people, got too comfortable. It was as if the rules didn’t apply to him—or his buddies within the district, or their husband’s companies—and he played fast and loose with taxpayer dollars. In the end, it cost him his job. Goldie’s decision to go peacefully is a bit of a surprise. There was word he was refusing to sign a release in which both sides would agree not to sue one another. A bitter divorce would have been entertaining, perhaps, but fruitless for all parties. His legacy has been distilled to seven bullet points, which can be found at the bottom of this column. Go, Beau, go. A CEO should be many things, but they shouldn’t be too proud to admit mistakes, especially when those mistakes involve taxpayer dollars. A public agency has to be accountable to its constituents, and Goldie was far more concerned with protecting himself and his long-term colleagues than shepherding public dollars in a transparent, responsible manner. He also used the district counsel’s office to insulate himself against requests for public information. If there is one person who should follow Goldie out the door, it’s the district’s adorably curmudgeon counsel Stan Yamamoto, who seems to think that attorneys aren’t required to show their work. Multiple times Goldie and Yamamoto have teamed up to prevent the release of damning documents. 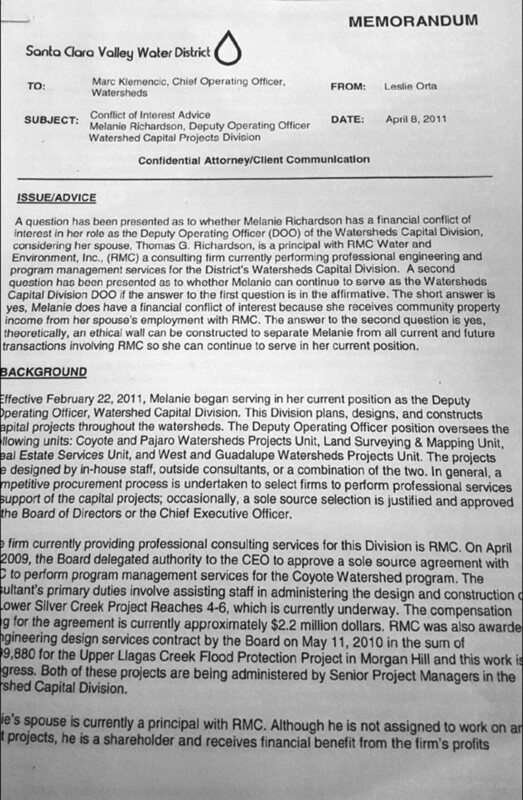 For example, they have refused to release information related to a “firewall” agreement for Melanie Richardson, an administrator in charge of flood control for the district who at one time oversaw procurement, and also happens to be married to an owner of RMC Water and Environment, a company that bids for and wins big-dollar consulting contracts with the district. It turns out, there is no “firewall” agreement, according to sources in the district, and any suggestion to the contrary by Goldie, Yamamoto or the spokesflak du jour is a lie. Here is an internal document from 2011 that proves Richardson has had a conflict of interest in the district’s dealings with RMC. “The short answer is yes, Melanie does have a financial conflict of interest because she receives community property income from her spouses’ employment with RMC,” wrote Leslie Orta, a district counsel, in a memo to Marc Klemencic, a former chief operating officer who is since retired. It remains a mystery why Goldie was so insistent on fast-tracking contracts to RMC, but he apparently got another approved before being thrown out the door. We’ll follow up on that. There remains a question of whether Goldie exceeded his authority when he started modifying contracts without board consent, and whether this put board members at risk of being sued. This definitely could have played a factor in his departure. One of Goldie’s final acts as CEO was commissioning an investigation into district employees who blow the whistle. It is taking place right now and Yamamoto’s office has dragged its feet on releasing contract details to San Jose Inside. The witch hunt is an obvious misuse of taxpayer dollars in a time of drought. Goldie’s cavalier attitude rubbed the board of directors raw, and the district’s employees were fed up with a CEO continuing to accumulate raises and performance bonuses while they did the real work day in and day out. The district can spit shine Goldie’s legacy all it likes, but it would do the public a favor by admitting addition by subtraction has made the agency more accountable. Beau Goldie’s top accomplishments, according to the Water District. Improving organizational performance and transparency through a comprehensive Management Audit Program. Investigate the current Ethics Department! Ethics, union, upper management, managers, the blatant lying by IT staff to the board regarding the boardroom, temp hiring, hiring in general, purchasing, there is so much for the DA to look at mainly collusion between all parties. most of this was brought up in the audit 2012. which is available online just google for it. You forgot to mention that SCVWD is affectionately known as the Golden Spigot. They’re either hosing you or raking you. Real journalism still works. Had Josh Koehn not exposed the problems of this CEO, had he not done the homework, read the documentation, connected the dots and exposed the scandals, Goldie would still be comfortably ensconced at the district. It was good journalism. The Metro gets its share of criticism. But even when we disagree with the angle of a story; Josh and his team are accurate and professional in their approach to stories. They are often cynical; but that is their job. George Shirakawa would still be on the Board of Supervisors and Beau Goldie would still be CEO of the water district without Josh’s efforts on behalf of the taxpayers. Someone ought to acknowledge that fact. In fact, at some point, someone should nominate him for a Pulitzer. He has earned it. > Real journalism still works. How is it that Hillary Clinton is gliding to her coronation on a surf of laundered foreign money with a debris field of public malfeasance in her wake, and yet the over class’s kept “journalists” do nothing but enthuse about the clever roguishness of Bill Clinton and his ability to make female journalists want to sleep with him and male commentators “get a thrill up their leg”? Or, is that you defination of “journalism that works”? Don’t know much about the rag biz, but isn’t “news” supposed to be something current, like within the last year? No one cares about George Shirakawa anymore, he’s history. The ink on Beau Goldie is still wet and Darcie Green is going down as we speak. So you’re 50% right, like my iPhone telling me when it’ll rain. How can you investigate whistle blowers. Whistle blowers are protected. Not at the District, the lady in charge currently (much like Beau) is sitting on a big pile of complaints. Another lady who was in charge of Ethics resigned after a year recently. Right before that the District hired a guy who quit the Ethics office after a couple of days! The Ethics department has a long scandalous history. Hopefully Josh will continue his investigations, as the CEO was just the tip of the iceberg. Hilarious about the ethics lady. I met her. She was kind but corporate and she knew she was on an up hill battle. They have not contacted me, and more than welcome.. nothing is protected in this country obama has sent many to jail for WB. It seems to me that the purpose of Boards of Directors of public agencies like the SCVWD is to provide oversight on the public’s behalf and prevent the years of abuse and conflicts of interest exhibited by Beau Goldie during his term as CEO. The Board has failed utterly in that task, which has cost the taxpayers untold millions of dollars. And when SJI locates the tip of the iceberg of Mr. Goldie’s malfeasance, the Board lets him resign, and the Board President, Barbara Keegan, drafts a press release gushing about what a great job Goldie did. TOTAL BS!! This is a shining example of how Boards protect malefactors in an organization to the detriment of the taxpaying public. This patty cake deal by the Board is clearly designed to stop further investigation. The Civil Grand Jury should initiate an investigation into Mr. Goldie and the Board of Directors, and SJI should help the CGJ by continuing to dig into this pattern of malfeasance by SCVWD executives and its Board of Directors. WORD, NO ONE EVER GETS IN TROUBLE BUT THE LITTLE GUY, LOOK WHAT GEORGE THROUGH LEADERSHIP FROM Beau, CAO, ravi, fung has done to IT dept and its employees, how many have left, how many fired, how many temps left in disgust, yet managers like fung and kamenjati are allowed to ruin lives. by allegedly feathering his own nest with sweetheart contractor kickbacks. by making sure anyone over 50 is put out to pasture and implementing an unwritten policy to have HR do everything it can to discriminate against hiring anyone over 40.
o Improving organizational performance and transparency through a comprehensive Management Audit Program. by establishing an unhealthy, almost fearful work environment, pitting environmental planning, biologists against engineering and pitting white collar against blue collar employee organizations; allowing executive management to reap huge salary increases while the most talented employees were kept in check and not given opportunities for advancement; promoting only employees who knew how to play politics best and the least talented managers. Sounds like you have inside experience with things that are daily occurrences at the water district. It is time to clean house and get rid of the BS !! It starts at the top . It is time to stop the political transparency pretense! So now the board need to step up, hold themselves to a higher standard, break up the upper management/worker competition discrimination games. The DA needs to come in and do audits, of assets, PR’s, hiring, bidding, lots needs to happen. Beau and his golden spigot/palace needs a shakedown. this is your tax money. This goes backs years and many of these points were brought out in the hidden but published scvwd audit 2012 (just google it or ask) about the glaring discontent between top and the bottom, sort of the 1% vs 99%. If there will be an investigation into actions by employees of the water district, may I suggest that the investigation include all water district employees who have the power to issue part-time and/or short-term contracts and specific rates of pay without reference to the board. That’s a perfect place to have some tool reward friends in almost total confidentiality. I was at the board meeting last spring when it became clear that Member Kennedy was spearheading drive to adopt the four short-term contracts, one of which had a conflict of interest. But staff members took a lively interest in the four contracts, apparently sensing benefits of some kind to themselves. In particular, the local government liaison took part when none of the issues appeared to be within his purview. A house cleaning is necessary from the top to a deep level, especially managers with the freedom to issue part-time and/or short-term contracts to their friends. @Dale Warner are you still on your personal vendetta against the person who outed you during your campaign for your past klanesque activities?? What meeting is this so we can view the video? Are you telling the truth, or just making up crazy claims again? You spent so much time promoting your “European American Causes” that your claims sound unbelievable once again. We all know who you are, and what you are about. We all know about your past too, both here and out of state. We all know you are still stinging from being outed locally, but we always want you to remember #thetruthmatters, #blacklivesmatter, #outingklanmembersmatters and #yourpastmatters. Excuse me.. My name is Beverly Turner. I am European American female who had the misfortune of working at the water treatment plant in the 1990’s. At that time Patrick Kwok was running a political Machine at the plant for local Asian want to be politicians, most of whom were not even American citizens. They would go off and meet for several hours a month, and leave the work to the rest of us. Pat even went so far as to say only hire Asian women. I tried to organize a group for European Americans, and ended up on the psychiatrist couch, trying to get me to say that I was part of a secret white supremacist group working in the secret depths of the city management. Unfortunately no such group existed except for the Asian supremacist group. Folks drove down from as far a San Francisco on the government dime to attend these meetings. outhEuropeans Americans have just as much right to organize as other groups. As a matter of fact our group was acknowledged by the governor so it is neither secret or exclusive. As a matter of fact we were working to get a European American Month in October display at the local libraries so European American youth would also have a shot at self esteem. This sounds like a civil rights issue.